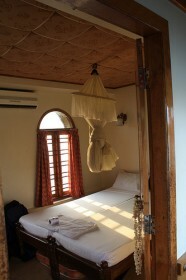 After four days in Mumbai, we were already feeling the need for a little escape from the dizzying chaos of the city. In just a few days, we had used up our nine lives trying to cross the city streets and were already blowing black soot from our noses and coughing up unmentionables. With our guide book promising “a deliberate and thoughtful pace of life as contagious as the Indian head wobble,” we were on the next plane south to the coastal state of Kerala. In South India’s coastal gem, we explored colonial Fort Cochin. Our noses danced to the tunes emanating from the fragrant spice markets and our eyes feasted upon the rows of fresh prawns, lobster and crab at the shoreline fishing wharf. In search of the country’s best beaches, we made a stop in Varkala where we fought off the oppressive heat Arabian Sea-side. 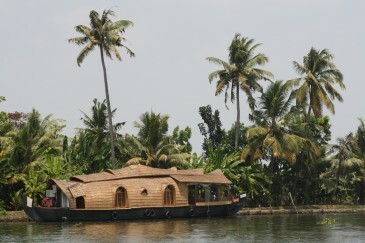 The highlight of our Kerala adventure, however, was undoubtedly our voyage down the backwaters. 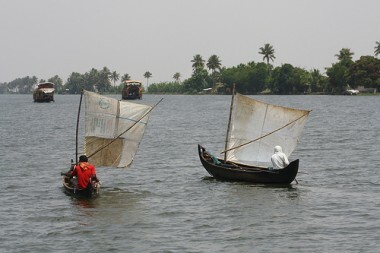 The backwaters of Kerala consist of an extensive network (some 575 miles) of canals and waterways running from the sandy coast and flowing inland. Long before highways existed, the backwaters were the only means of transportation for local villagers and still play an important role in daily life. Today, the water passages also find themselves at the center of the Keralan tourism industry. 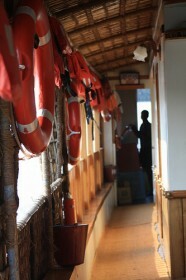 Several of the area’s larger towns now rent out riverboats for excursions down the remote waters. 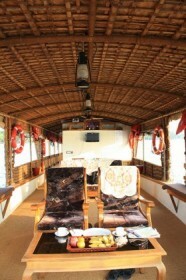 We found this idea of exploring the lagoons and waterways aboard a luxurious houseboat wildly appealing and decided to set sail. Our first course of business was finding a proper boat to suit us on our journey. We spent a day boat shopping and found the charming boats were all handmade out of bamboo in the traditional, rice barge style. They boats do vary widely in terms of amenities with some no more than rickety, shacks while others, more like floating palaces. We were promised a gem of a boat big enough, in the words of its owner, to host a proper cricket match. The following day we took to the waters and discovered we were in for a treat. With just the two of us as passengers, it came with a private staff of three – a captain, a chef and a waiter – who greeted us with lays of jasmine and coconut water. They showed us our new digs, which included a bedroom, a bathroom and a separate sleeping area for the staff. There was a kitchen where our meals would be prepared and the best part was the enormous bow. Clearly more space than we would ever need, the bow was equipped with a full dining room table, a sofa, chairs and even a plama screen TV. Floating through the palm-studded canals and steamy jungles, we came face-to-face with daily life of the colorful Indian villages. Along the way, we saw fathers paddling their children in wooden canoes off to school before setting out for a day of fishing with their bamboo poles. We heard the beating of laundry against the shoreline rocks and the clanking pots and bans in the murky water. We felt the heat of the hot sun beating down on brilliantly colored Hindu temples and the tired faces working the rice patties. At day’s end, we admired the cool detachment of families splashing playfully together in the waters bathing after a hard day of work. As we took in our surroundings, our cook prepared a delicious South Indian meal, and we enjoyed the quiet afternoon sipping down our chai masala (India’s sweet, milky tea) and munching on fried bananas. We picked up some massive tiger prawns from the fisherman on the side of one of the canals to be prepared for dinner and docked our boat for the night in a small village just in time to watch the sun set over a field of rice terraces. Sailing the backwaters of Kerala, we were treated like royalty, and I felt like an Arabian princess being carried off to my palace. The experience, however, was far more than this. Far away from the chaos of city life, in the stillness of the backwaters, this journey reinforced what I was already beginning to uncover about this country. Amidst the most basic of conditions life is tough, but happy. People struggle but lives are peaceful. And in all helplessness, there is immense sense of hope. Docking our houseboat meant our Keralan journey had come to an end, but my window into the village life of the Keralan people will be en experience I won’t soon forget.